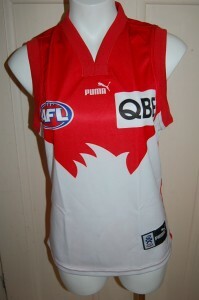 Indigenous Round of the AFL fixture ignited passion , and precipitated changes , to the traditional football jumper , jersey , guernsey . The first game of the fixture saw Collingwood being soundly beaten by the Swans , on friday night footy at the MCG . Twenty years ago , at the Saints vs Pies game at Victoria Park , Collingwood fans racially abused Saint Nicky Winmar , who , in retaliation raised his footy jumper , and pointed to the colour of his skin . In a startling scene of Deja Vu , a similar incident occurred at the Pies Vs Swans match. Swans player , Adam Goodes , pointed out a young Collingwood fan who racially vilified him . She was ejected from the ground in the dying moments of the last quarter . In an eventful week , Collingwood FC President , Eddie McGuire also made a racially inappropriate comment on Melbourne Radio . 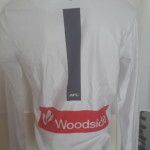 In a growing trend , three clubs changed their traditional footy jumpers , for the indigenous round . 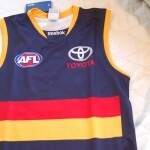 The Crows adopted a black strip to replace their original dark blue , along with their usual red and yellow, to imitate the Koori flag . 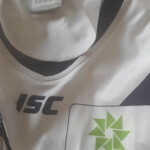 Fremantle Dockers used their original colours of purple and white to create an effective allover design of aboriginal artwork , in which boomerangs featured heavily . 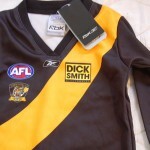 Richmond Tigers building on their indigenous artwork designs of previous years , incorporated a Dreamtime theme of Boomerangs , into their traditional yellow sash on a black background . The pressure to succeed and the unpredictability of the modern AFL game was never more evident than in last weekends round of matches . The Cats thrashed the Lions at the Gabba', Western Bulldogs beat in form team Sydney and the Saints suffered their third loss in a row to a speedy , youthful Bombers side . The Richmond Tigers looked poised to breakthrough with their first win of the 2010 season only to have it snatched away by their Hawthorn opponents in the dying moments of the game. 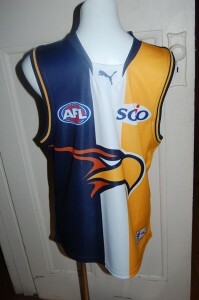 A youthful Melbourne Demons team were no match for a rejuvenated West Coast Eagles who beat them soundly at the MCG. Interstate results saw Carlton hold off Port Power at AAMI stadium and the Collingwood Magpies beat vastly improved Fremantle Dockers at Subiaco. Many fans, tipsters and media commentators would have expected different results to those posted in this round of matches . Fans were out everywhere in their jumpers , jerseys , guernseys to cheer their team on and to will them to succeed. 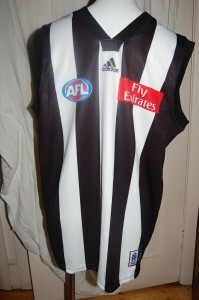 AFL team , the Collingwood Magpies packed their famous black and white team colours jumpers , jerseys , guernseys to travel interstate. They played Fremantle Dockers at Subiaco , Western Australia on Friday night . 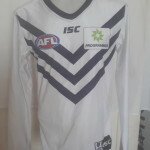 The iconic black and white colours triumphed over the predominantly purple and white of the Dockers . AFL Football Teams will travel interstate to play footy with mixed success. On friday night in Western Australia , the black and white's triumphed . 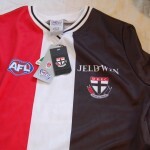 Fans were resplendent in their black and white jumpers , jerseys, guernseys . AFL team Collingwood's players ran off the ground in their black and white jumpers , jerseys, guernseys exhausted but triumphant .